VOL. II NO. 51 REG NO. L5015 DELHI, THURSDAY AUGUST 31, 1944. 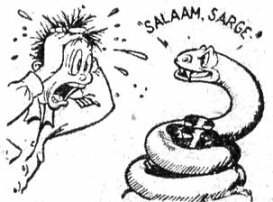 "Way 'round the other side of the world at New Delhi, India, the U.S. Army publishes a snappy weekly tabloid, the CBI Roundup, which calls itself a fishwrapper and tries, within the limitation of its own lingo, to keep the servicemen in the CBI Theater informed and amused. "To the Roundup, the week's best cheesecake is a page-one must; the U.S.A. is always 'Shangri-La'; and there is always a story with a moral." And for the benefit of those who are not familiar with PM, we can tell you right here and now that they too, within the limitation of their lingo, are pretty informative and amusing. Figures published this week by the Chinese Ninth War Area revealed that between May 25 and Aug. 19, 1944, aircraft of Maj. Gen. Claire Chennault's 14th Air Force have accounted for 23,077 Japanese killed in the Hunan fighting, 45,121 wounded, and 14,259 horses killed. Other statistics showed 2,435 junks and 2,833 sampans sunk, in addition to nine gunboats and 63 steamers, in attacks on Jap supply lines. Ninety-two tanks and armored vehicles, 2,416 trucks and 72 gasoline and ammunition dumps also fell to the 14th's marauders. Forty-four bridges were knocked out in this period. In the aircraft division, 206 Japanese planes were destroyed in the air or aground, with 38 probables and 38 damaged, said the report. The process was still going on this week in China, where B-25's and fighters made repeated and heavy attacks on Yang Tien, Leiyang and Anjen in the Hengyang battle area. On one mission near Anjen 500 troops were strafed with unestimated casualties. Yangtze River and Tungting Lake shipping took another beating. Three large steamers, a 150-foot junk and a 125-foot supply vessel topped the list of victims, which included numerous smaller supply craft. Airfields at Siangtan and Hengyang were both hit twice. Other 14th Air Force planes raided docks and shipping at Samshui and Kongmoon near Canton and pounded Jap targets on Fuyao and Matsu islands northeast of Foochow. Marine barracks were strafed at the latter site with 250 casualties resulting. Enemy air resistance was surprisingly slight, only six Jap planes being shot down, plus five probables and five damaged. Nine American aircraft were missing. WASHINGTON - (ANS) - Madame Chiang Kai-shek, China's First Lady, is seriously ill and will come to the United States in a few weeks for "badly needed" medical care from the same doctor who treated her two years ago, her brother-in-law, Chinese Finance Minister Dr. H. H. Kung, reported this week. The American-educated wife of the Chinese generalissimo is now in Rio de Janeiro, where she flew last month from Chungking with her sister, Mme. Kung. Nature of Mme. Chinag's illness was not disclosed. LEDO ROAD - Throwing his arms over the back of the homemade bench, Shorty crossed his legs and nonchalantly brushed a big, galloping ant off the rough mess board. "Ya know, sometimes I think we guys in Burma are misunderstood," he said and reached for the cup of hot java. "You ain't just a birding tooting," big Joe from Brooklyn agreed. "People back home think it's like India or some other soft place." Shorty continued: "Only yesterday I got a letter from my ma. She wanted to know what I was doing standing in front of a back house in that last picture I sent home. 'Besides,' she said, 'what are you doing in those dirty overalls. Where are your clean sun tans?'" Shorty blew into the steaming coffee, swatted at a horse fly and went on with his story. "I wrote my ma and told her that it ain't no back house. That's where I live. And I haven't had khaki's on since I hit Burma. Ya see, she just doesn't know." Brooklyn Joe champed on a hard tack biscuit with all the grinding noise of a rock crusher. "Yeh, I'm on the black list with my goil. She says I never send her nothing. Dere ain't nothing to send, I keep telling her, except Jap rupees." The tattered Hessian cloth curtain parted and a dusty figure filled the opening to the mess shelter. "Hi, fellas, what's for chow?" "Well, if it ain't the paragraph trooper from the rear echelon," Shorty blurted. "How's things in Assam, chum?" "So-so, he replied, "too much chicken dirt for me, though. By the way, fellows, where's the shower room?" the Assam arrival asked. "Dere ain't no shower room, stupid," Joe retorted, "but just wait a minute. It'll rain. And if you can't wait, dere's a creek down the hill." "See what I mean," Shorty bellowed, "we're misunderstood here in Burma." "Where's the shower room," he mumbled in disgust and went stalking off. CHINA - The Chinese High Command this week announced that the swarming Japanese armies have launched two new offensives in their drive to link up the Peking-Canton railway. One enemy force, fanning west towards Honan from the railroad, reached points within 25 and 30 miles of Miyang. The Chinese had previously pushed to within a few miles of the Peking-Hankow sector of the vital link in the area of Chumatien and Kioshan. In Southwestern Kwangtung province, other Jap troops, plunging north from the Liuchow peninsula, occupied Limkong, four-way highway junction at the base of the peninsula. While the Japs drove west from the railroad in north and south China, Chinese units in Hunan in Central China, managed to cut the line at Kangtien, 25 miles south of Chuchow, and Chuting, 20 miles north of Hengyang. Fighting was in progress around Ichang in Hupeh province, with the Chinese reporting heavy casualties among the enemy after an artillery attack on Tangyang, northeast of Ichang. Meanwhile, the China Central News Agency reported that Gen. Chang Teh-Neng, commander of the Fourth Army, was executed in Chungking this week for "negligence of duty," resulting in the loss of Changsha to the Japanese in June. The broad, majestic Brahmaputra river, fringed by flat river lands and bordered by tapestries of distant jungle mountains, is one link in the line of communications between the Indian ports, where supplies and men arrive in the Theater, and the forward areas in Assam and North Burma. 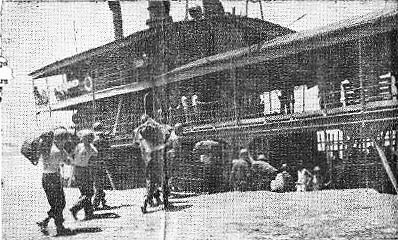 Troops and equipment are unloaded at the terminus of the main railway line and transhipped to ancient river steamers or barges for the journey up-river to another port, where they must again reload on the narrow-gauge, G.I. operated railroad which carries them to their destination. These pictures show one outfit of travel-stained and weary troops, en route to North Burma a while back, steaming up the Brahmaputra at a snail's pace on the river leg of their trip aboard a battered, grimy steamer, the Buzzard. 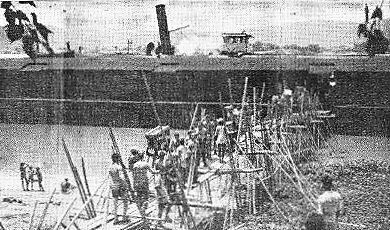 Piling out of the third-class railway coaches, the lads worked long hours in the hot sun carrying barracks bags, rations and equipment from the train through the ankle-deep sand to the hold of the boat. Aboard, they slept the sleep of the weary the first night, but next day crowded to the rail to look out over the muddy waters at the desolate sandflats or the purple mountains of Assam. They watched porpoises play in the water, fished unsuccessfully, played cards, read or wrote letters to pass the long hours. They swapped wild and improbable rumors as to their destination as they ate their twice-daily cold rations, showered under a single crude tap, staged a songfest with two battered guitars when they could not sleep on the hot, jam-packed decks. Just another bunch of G.I. 's on the move, making the best of a rough trip. As for Brahmaputra scenery, it shouldn't happen to a dog. (Army Signal Corps photos). The loading detail gets to work as Outfit X flies by getting their barracks bags and other equipment aboard the river boat, preparatory to sailing up the Brahmaputra. The G.I. 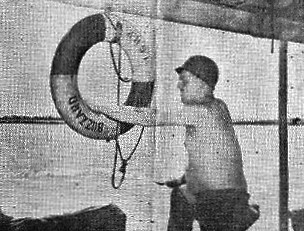 's tug and strain at a large box of equipment, eventually pushing it up the ramp to storage space aboard the steamer. 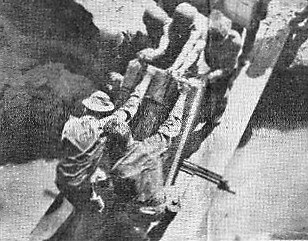 Closeup of troops unloading box cars of equipment to be loaded on their vessel. There's nothing like a smoke to settle the nerves. Members of Outfit X huddle together on the deck and pass the long hours of the night in songfest. The G.I. at lower left is two thirds in slumber land. Card players have their day. Left to right: Pvt. Harvery Morstein, Cpl. Lawrence Kufert, Cpl. Chuck Treat, Pfc. Anthony Pellegrino. Left: onlooker Cpl. Virgil Duncan. Going through the chowline. The cooks look suspiciously happy as the boys pass by. Food was made from "B" and British rations. T/5 Harold T. Adolphe gazes over the railing at the broad stretches of the Brahmaputra's muddy, dirty waters. What goes on must come off, which is the sad story releated by this picture. Here Outfit X unloads supplies they will carry with them aboard train to take to destination. CHINA - The huge, silver Superfort touched her wheels down on China's good earth. The pilot, sharp taut lines of fatigue etched on his face, dropped from the bowels of the sky giant and headed for the interrogation room. "There goes R.O.N. Roberts" whispered a G.I., "one of the best damn pilots in the Air Corps." Army records list him as Major Donald W. Roberts, Superfortress pilot par excellence, but to hundreds of friends and to pilots everywhere he's known as Remain Over Night Roberts. In temporary bamboo alert shacks on jungle air strips, in elaborate civilian pilot recreation rooms, in army barracks and officers messes - wherever pilots congregate you're certain to hear tales of R.O.N. Roberts. The Major's been flying a long time now. The log book credits him with 7,500 hours. He started flying the old Ford Tri-motor planes for the Transcontinental Air Transport Lines when aviation was still teething. The Major knew lots of people on the coast and he always paid them a visit when he landed near their homes. "Friends were always asking me to drop in for a cup of tea" grinned Brown, "They certainly like their tea on the West Coast." In those days the civilian airlines had not as yet begun to work with the clocklike precision of modern day lines. It was common sight to see R.O.N. marked next to his name on the operations board. In time he was simply known as R.O.N. Roberts. After a futile effort to get into combat with the Royal Canadian Air Force he enlisted in the USAAF and was assigned to ferrying B-24's around the country. "I never had trouble getting crews," recalled Roberts. "The fellows knew my next assignment almost before I did. I guess they had lots of friends scattered over the country too." One particular trip remains stamped in his memory. He flew a B-24 to Mitchel Field, New York, stopping enroute to drop off two crew members who lived in Chicago. He was due to start back to Fort Worth the following morning when the weather closed in. "The next ten days were a nightmare," said Roberts. "When the weather was good in New York I couldn't get into Chicago. When Chicago opened up New York closed in. When I finally got back to Fort Worth the C.O. was waiting for me on the field. I still have nightmares when I think of the very warm reception he gave me. I showed him all the New York and Chicago weather reports but when he asked why I didn't come over the southern route I closed up like a clam. I knew I was licked." The Major had a bit of trouble on last week's daylight attack on Japan. As he turned away from the target his outboard engines began to miss and sputter. "For a few minutes I thought we weren't going to make it back," said Roberts. "That was one time I wasn't anxious to remain overnight. I haven't any friends down there and besides I don't like the brand of tea they drink." AWARD FOR WESSELS Gen. Joseph W/. Stilwell pins the Silver Star on Brig. Gen. Theodore F. Wessels for gallantry in action as commanding general of the Myitkyina Task Force. Wessels commanded the force in the capture of Myitkyina, after which it was disbanded. This award took place at Kandy, Ceylon. (SEAC Photo Unit). In a recent letter to Gen. Joseph W. Stilwell, Gen. George C. Marshall, Chief of Staff of the U.S. Army, praised the record of the Services of Supply in handling transportation in Calcutta and along the Assam line of communications. Commenting on the recent improvement in transport in the CBI, Marshall said, "Gen. Somervell has reported to me the splendid record which has been made in handling of transportation both in Calcutta and along the Assam line of communications." Marshall goes on to laud men who have been engaged in this job in India and who have been able in recent months to maintain supply levels at a high point. In addition, he commented on the fact that the American cargo-handling in Indian ports have kept them high in the Army Service Force ratings of overseas ports in the past six months. The Chief of Staff adds that "All of this indicates that your transportation people have done an outstanding job despite the many difficulties not normally encountered in other theaters." He closes with a request that his appreciation be passed on to those who have been engaged in the work. 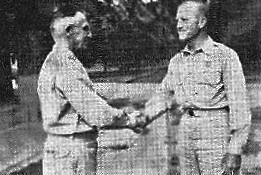 In a letter to Maj. Gen. William E. R. Covell, Commanding General of SOS in CBI, Stilwell added his praise to that of Marshall and asked that those responsible for this fine job be given a "pat on the back." In recent months in CBI the entire transportation system has been speeded up. The G.I.-operated Baengal and Assam railway has increased its tonnage figures more than 50 percent. The ports handle the cargoes quickly, get them off to the forward areas faster than ever before. In a story pertaining to the activities of the Air Transport Command, Roundup made a statement to the effect that during the months of April, May and June, 1943, the Second Troop Carrier Squadron transported 60% of all tonnage that crossed The Hump, in spite of the fact that it only had 10% of all planes flying the route. Roundup was wrong. Roundup should have credited the Second Troop Carrier Squadron with having transported 12.5% of the tonnage with 10.2% of the planes. Roundup apologizes and will now go stand in the corner. Five chicken colonels on duty in CBI this week were promoted to be general officers, according to a War Department announcement. Those who gained the coveted star are Colonels George W. Sliney and Robert Cannon, who have been serving with the Chinese Training Center Command, John P. McConnell, Deputy Chief of Staff to Air Marshal Sir John Baldwin, commanding the Third Tactical Air Force, Winslow C. Morse, with the 14th Air Force, and Alvin R. Luedocke, Operations Officer, India-Burma Section, ATC. The future assignments of these officers have not been announced. HQS., Y-FORCE, CHINA - Bobby, Margaret and Jeanette, the three children of American missionary Rev. William T. Blackstone and Mrs. Blackstone, have won the hearts of G.I. 's and officers at this southwest China base by their antics, reminding the men of the kids back in Shangri-La. Their performances asa singing trio in the troops' military hostels have been warmly applauded, but mostly they are favorites because they are three natural Americans who like to ride in the soldiers' jeeps, on the handlebars of their bicycles, or go through pockets to find candy. There are always two or three servicemen around the Blackstone house playing checkers with the children, and this week Bobby will realize a life-long ambition by being a guest of the G.I.'s. Four-and-a-half year old Jeanette, born in Shanghai is the youngest. Her twinkling eyes and heavy blonde curls won her the nickname of "the big doll" from boys in a bomber squadron. Jeanette sings the solos and carries the air when the kids do their stuff musically clinching the show with a ballad about a crow's egg which falls from the nest on a passerby and "covers him with me." Bobby, 11, was born in Hengyang, from where the family fled several months ago before the city was abandoned to the advancing Japs. He is a fine-featured, sensitive boy who likes to read. The Roundup and Yank are favories with him. Margaret, aged nine, completes the trio. She was born in China. The youngsters get their schooling from their mother, despite the difficulty of getting books through the blockade. The musical Blackstones are well known throughout Hunan province, with Dad singing baritone and Mrs. Blackstone accompanying. Rev. Blackstone, formerly of Pasadena, Calif., is a Presbyterian missionary assigned to U.S. troops in this area. ADVANCED FIGHTER BASE, BURMA - The Japanese Army in North Burma resorted to navy tactics with one of its big anti-aircraft guns recently in a desperate attempt to ward off the terrific beating they were getting from 10th Air Force planes of the EAC. Although the enemy gun was doing very little damage to 10th Air Force aircraft, American pilots found it disconcerting that every night the gun, located somewhere on the Irrawaddy River, was always in a different position. In no two consecutive days was the gun in the same spot. Screen lovely Ann Sheridan is shown here hanging out a "few things." In China she was forced to do her own laundry work. Ann, accordionist Ruth Denas and dancer May Landa pause in their laundry work to discuss tattle-tail gray and other horrors of war. The three lovelies were surprised to find that there weren't enough Chinese laundrymen to serve everybody. 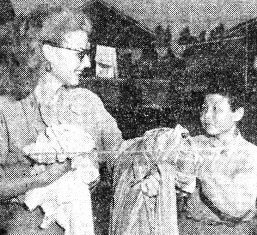 The glamorous Ann's wishful ways quickly won her a helper in the distasteful job of washing her own clothes while in China. This little Chinese boy seems quite happy. And who wouldn't like to help Ann hang out a "few of her little things." In Assam, the Oomph Girl met an old friend with an American salaam. He's S/Sgt. Raymond Gray, ex-stand-in for John Garfield. CHINESE-AMERICAN COMPOSITE WING - Ann Sheridan brought a lot of happiness to a lonesome bunch of G.I. 's back here in interior China, when, with her USO troupe she gave a performance that certainly reached a new high in soldier entertainment. 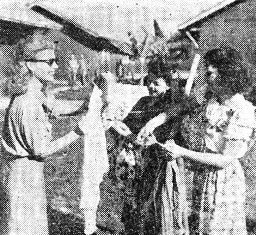 Col. W. C. Morse, commanding officer of this Chinese-American Wing of Gen. C. L. Chennault's 14th Air Force, personally greeted each member of the company - Miss Sheridan, Mary Landa, Ruth Denas, Ben Blue and Jackie Miles. With the colonel was a welcoming committee of Chinese and American officers and enlisted men. Heading the latter delegation were Sgt. Maj. Norman M. Chindler, T/Sgt. Leonard W. Fairfield and Sgt. Homer C. Lockwood. Ann Sheridan put a brand new touch on the autographing business when instead of writing on his short-snorter bill she took a piece of chalk and autographed the pilot's plane. From the second they appeared in the doorway of the transport plane that brought them to our little airdrome they were besieged. They posed and clowned for every conceivable kind of a picture until the very last film in the last G.I. 's camera had been exposed. They answered a million questions and told all about what is going on back home. At noon these congenial folks were the guests of the enlisted men for luncheon. All five members of the party split up - they wanted no special table - and each sat at a different table surrounded by as many of the boys as could crowd around. Rooms had been prepared in the Hostel so that the guests could relax a bit before curtain-time but they couldn't be forced to take even five minutes for themselves. They just kept putting out until they actually were late for the performance. And when they stepped out on the stage every soldier in the room felt that he was seeing old friends. The fire hydrant has turned on the dog, the lamb has slaughtered the lion - this week in New Delhi an unidentified officer swindled an Indian jeweler, and with the ancient "snipe-hunt" technique at that! This shady character entered the babu's house of business and asked to look at some very expensive rings. He picked out two or three of the better ones, then announced that he would like to show them to his wife at a nearby hotel, so that she might make a choice, and would the babu kindly accompany him to the said hotel? The trusting merchant would and did. At the hotel the sly one said: "Wait upon me here in the lobby while I go upstairs to my room with the rings. I shall soon return." NORTH BURMA - When Sgt. Walter J. Bator of Northern Combat Area Command goes home to Detroit after the war, the toughest mobby of Purple Gang fame will be just another guy. Bator walked into his basha the other morn to delve into his barracks bag for a clean handkerchief. He took one look, let out a yell and cleared the basha of the other occupants. Coiled around his barracks bag was a giant python. After Bator's alarm it decided to leave. But the sergeant picked up his carbine and let the visitor have it twice. The second shot was the coup de grace. Measurements show the python was nine feet, three inches long. Bator has skinned the snake and plans to take the skin home for a souvenir. TENTH AIR FORCE BASE, BURMA - It's the most exclusive club in the world, yet it's quartered in a beat-up bamboo basha in a recently-cleared Burmese jungle. The only possible way to attain membership in the Century Club is to be a member of a fighter squadron of the Tenth Air Force who has flown 100 or more fighter missions against the Japanese. The price of entry is high but the club has a big and rapidly growing membership. The Century Club was the brainchild of Capt. Henry J. Pashco, of Somerville, Mass. In its early days the club had a membership of but half a dozen members of Habecker's Hive, as the squadron is known. Requirements for membership of 100 missions against the Japs appeared fantastic in those early days of the CBI campaign, but the rule remained rigid. Now the swollen membership consists entirely not only of men who have flown the 100 missions, but each of them has been awarded the Air Medal and Distinguished Flying Cross. The members of this exclusive club? They're typical of all U.S. fighting units in this war. They're from all walks of life; the farm, the industrial plants, classrooms, the huge homes of "Snoot Row" and from offices. But now they're vets of combat who know all the wiles of the tricky Japs. The original charter members of the Century Club elected Hank Pashco the first president. President Pashco is still the top man in the club, leading all other members in record flying. To date he has 168 combat missions against the enemy to his credit. In selecting their sweetheart, Century Club members preferred the lovely Anne Margaret Kinnaird, shown here. She is the daughter of Lt. John Kinnaird. 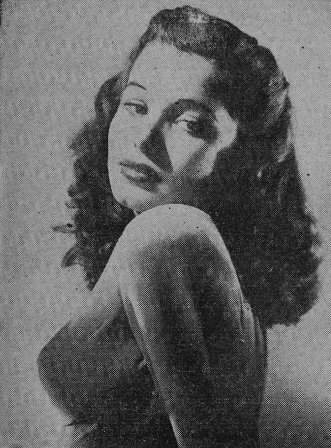 The "Sweetheart of the Century Club" defeated Movieland's Oomph Girl Ann Sheridan at the polls, 26-0. The club also boasts a beautiful sweetheart. Nine-month-old Anne Margaret Kinnaird, of Nicholasville, Ky., has been duly elected "Sweetheart of the Century Club." To gain this title, little Anne scored a smashing victory over some pretty stiff competition, defeating screen lovely Ann Sheridan, who is currently touring the Theater, by a unanimous vote of 26 to zero. Sweetheart Anne is the daughter of Lt. John M. Kinnaird, who is one of the newest members of the club, having just completed his 100 missions. To those persons who ask about the future of the Century Club, the members give different answers. Some of them urge peacetime continuity with membership restricted to men in the "Hive." Others hope the club will expand and open its doors to all American pilots in this global war who have flown more than 100 combat missions. Nevertheless, the Century Club members are determined that the club will flourish as long as the Jap offers resistance. Here are a few of the members of the Century Club. Each of these fighter pilots has more than 100 combat missions to his credit. From left to right, first row: Lts. Eugene G. Wulff, James N. Marr, George A. Bennett and Robert C. Rayfield; second row: Lts. William G. Lamb, Jack R. Starkey, Lt. Col. John C. Habecker, Lts. 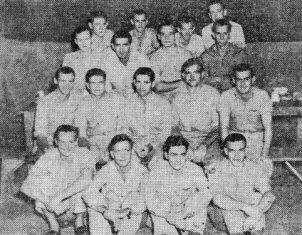 Erwin H. Letak and Steven A. Koehl; third row: Lts. John M. Kinnaird, Capt. Roland J. Migues, Lts. Robert P. Beech and Richard R. DeLong; back row: Lts. John E. S. Disney, Jesse E. Townsend, R. H. Dolan and James L. Woodcock. The Century boys finish a hard day of combat flying in the Burma jungles with a little close harmony. Lt. Robert C. Rayfield gives out on the organ as Capt. Robert A. (Tony) Clendenin beats out the rhythm. The vocalizing is being done by members of the Century Club Choir. From left to right, Lts. Richard H. Newcomb, Richard R. DeLong, (Rayfield), Robert P. Beech, George A. Bennett, John M. Kinnaird (little Anne's papa), Lt. Col. John C. Habecker, Lt. Erwin H. Letak (and Clendenin). These pilots "sing" pretty good with hot lead, too. NORTH BURMA - "Queen of the Monsoon,"
chosen by personnel of the Northern Combat Area Command Headquarters recently, is Mrs. Charles Johnson, of Rye, N.Y., wife of Pfc. Charles Johnson, member of a Signal Battalion in Burma. Selection of Mrs. Johnson was made from over 200 photos of wives, sweethearts, sisters and friends of both officers and enlisted men. The judges were Brig. Gen. Haydon L. Boatner, Col. Robert Cannon, Lt. Col. James Cairns, Capts. Joseph Sylvia, Shy Greenspan and Perry Clark and Lt. Alvin Davis. ALONG THE LEDO ROAD - Set amidst the towering trees and clinging vines of the dense North Burma jungle, an American Army chapel was dedicated this month at an isolated spot where white men had never before ventured. "No longer can this be considered a God-forsaken spot," said Father Cyril Jablonovsky, Catholic chaplain, as he spoke at the dedication of the second chapel the unit had erected on foreign soil. Chaplain George R. Wilson offered a prayer of dedication for the building. Nurse Lt. Helen Dugan and Cpl. 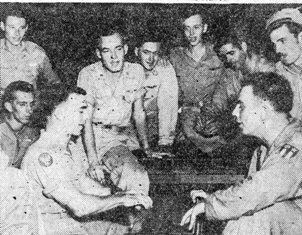 Leonard Wolf sang religious songs, accompanied on the piano by Sgt. Vincent J. Carrozza. STRICTLY G.I. By Ehret "I'LL RACE YOU." Rotationists going home were recently given the following rules in mimeographed form by Capt. Edward A. Bartolina, squadron C.O. They were made up to guide the bewildered CBI G.I. when he gets back in Shangri-La and faces the dangers of the home front. As your ship sails through a bottle-neck channel, a large chunk of faded green metal with a twelve-foot torch at the top looms. Approaching closer, it reveals itself as something seen in miniature on the back of a two-bit piece. On this one occasion, the ARs will be waived if your emotions stir you to a rigid salute. Barracks bags are NOT to be dropped in the bay. You are now back in the Zone of the Interior and G.I. equipment is no longer expendable. All the bronze stars won on Queensway and now attached to the Theater ribbon are to be polished to a high degree for public admiration. EMs who have won recognition for chiseling a tonga-wallah out of two (2) Annas will abide by meters found on the right-hand side of taxis. This applies particularly to Delhi commandos. For those who have suffered cobra bites, jungle fever, and Jing Bao delirium, special concessions are offered. They may whistle long and shrillingly after blondes with accentuated front-porches. Right arms are not to be camouflaged in slings, it will be presumably safe to salute every third passer-by. Some G.I. 's who have been sweating it out over here for the required time are seeing replacements under every rock these days. Witness the case of some Signal lads on a Burma hill station, confirmed practical jokers, who recently heard they were to be pulled out after nine months of jungle life. In anticipation, T/5 Fabian P. Thompson appeared at breakfast one morning divested of the luscious beard he had worn for many a day, and looking a very different boy. Quick-witted T/5 Tommy Johnston, detachment cook, spotting T/5 Edward Looker, another late-comer to chow, grabbed him by the arm and announced, "Ed, I want you to meet Paul Jones, your relief, who has just arrived from the valley." And Looker, failing to recognize his buddy of nine months without the beaver, seized Thompson by the hand and pumped away with a hearty "Sure glad to see you, fella." I have open before me a letter from my mother stating somewhat mysteriously, "The new baby is quite pretty and fat, but John is still my pride and joy." The information - typical of the information I get in letters from home - is mysterious because I know of no one expecting any and therefore can't imagine who the new baby belongs to. There are dozens of people named John, and if he is my nephew, I prefer to have him called John Walter. This matter of mysterious-information-in-letter-from-home I have discussed with a number of friends who have undergone similar experiences, and we have come to the unanimous conclusion there is a definite conspiracy at home to bewilder sons and daughters abroad. "I suppose you've heard about Uncle Henry. But then you know how it is . . "
Well, for one thing, I never hear about anybody at home except through letters, and I definitely don't know how it is anymore. In the meantime I continue to wonder whether Mrs. Dugan ran off with the iceman, broke her collar bone on the cellar steps or was arrested for disobeying rationing regulations. She might even have eloped with Uncle Henry, for all I know. There are other things, too, which aren't very clear - odd facts about strange people who drift in and out of letters from home with surprising regularity. Beulah has triplets. Chick is in the Solomons where he ran into that little boy who used to live out on West Ash Street and stuttered, etc. And never did I hear of anyone named Chick or Beulah, and I don't remember anyone who stuttered on West Ash Street. WASHINGTON - (UP) - The urgency of Donald Nelson's impending mission to China was emphasized by the disclosure in President Roosevelt's Lend-Lease Report to Congress this week that China's armament program is unable to supply even spare parts for the few thousand American trucks sent there before the Japs cut the Burma Road. The report said the spare parts and tires for the trucks comprise part of "the small amount" of goods now being flown to China. However, the report reflected the stepped up pace of operations against Japan, showing that Lend-Lease shipments to China-India, Australia and New Zealand climbed from $259,000,000 in the first three months of this year to $351,000,000 in the second quarter. Noting that Lend-Lease shipments reached a total of $28,270,000,000 July 1, Roosevelt urged a continuation of the program after the defeat of Germany to insure a speedier victory over Japan. 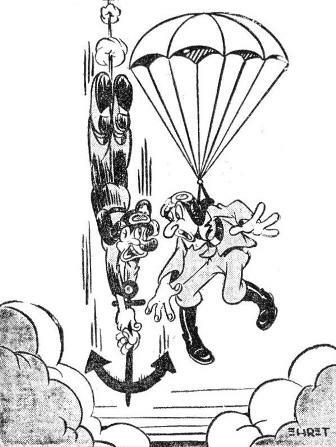 In an apparent reference to recent discussions whether Lend-Lease could not be halted after the war in Europe ends, the President declared, "We should not permit any weakening of this system of combined war supply to delay the final victory by one day or to cost unnecessarily the life of one American boy." He said the program should be continued "on whatever scale is necessary" until the unconditional surrender of both Germany and Japan. The present Lend-Lease law expires June 30, 1945 unless terminated sooner by joint Congressional resolution. CHINA MISSIONARY This picture of Lois Collier was sent in by S/Sgt. Bill Bentley of the 14th A.F. He says on the basis of picking her as his favorite pinup girl that years ago she wanted to be a missionary to China and anyone who looks like her would be welcome there. MYITKYINA - You had been introduced to him in the morning at Lt. Col. Gordon S. Seagrave's hospital, now snuggled against the green bank of the Irrawaddy River. Like the Burma Surgeon, he wore a silver leaf and insignia of the Medical Corps. He was Lt. Col. W. W. Hiehle, Surgeon of the Myitkyina Task Force and now it was afternoon and you were seated on a wooden box in his tent, while a light rain beat desultorily against the taut canvas. This was comparative luxury - the Signal Corps switchboard, the hurricane lantern, the rude wooden boxes for official files, the portable typewriter, the artillery shell for a paperweight. Brisk, intense Hiehle (pronounced "Healey") wanted to tell you about the three American Medical Corps units which had participated in the campaign along with Seagrave's famous polyglot organization. Two of these were Portable Surgical Hospitals one of which, commanded by Maj. Harold B. Harris, marched over the Kumon Range with the Chinese-American troops who seized the airfield May 17, and the other, commanded by Maj. E. J. Sarpen, which was flown in during mid-June. The third was Col. Warren Diessner's Field Hospital, flown in July 13. The fighting in North Burma has boiled 20 miles south down the road toward Bhamo. Action is momentarily on a reduced scale, and you are told by Hiehle that this factor has enabled him to give the personnel of Harris' outfit a well-deserved leave. "This unit during the rugged 110-mile trek to Myitkyina operated at night after marching all day," explains the colonel. "Thereafter, it functioned at the airstrip, where it was for many weeks subjected to Japanese air and ground attack." Nor, Hiehle continues, did the other Portable Hospital work under ideal conditions. During mortar bursts, litters were taken off tables, lowered to the ground, and the medicos operated from a kneeling position. You listen while Hiehle tells you of a unique incident in which a battalion of the 14th Chinese Division made a sweeping end run, plunged ahead too far and found itself cut off and surrounded by Japs. There were Chinese wounded in the isolated pocket. "We couldn't get help into them - too damn many machine guns. So we airdropped medical supplies and litters. When contact was established, the casualties were brought back in the shortest time possible for treatment." The Task Force surgeon describes to you the job of the aid men, constantly under fire, as most heroic and hazardous and that of the enlisted technicians of the Portable Surgical Hospitals as the toughest and best. "Many of the technicians," he says, "developed the skill of surgeons. Casualties never reached the hospitals until late in the day, and these men often worked all night." Jap wounded were treated by the American medical units, 30 in one day by Harris' organization. 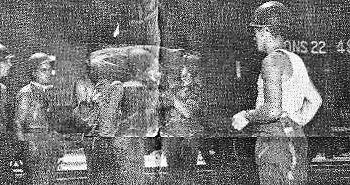 Hiehle tells you that few of them appeared to give a damn at having fallen into Yank hands and that, matter of fact, many seemed relieved to have been captured. Practically all were suffering badly from malnutrition to the point where they could hardly stand, and most of their wounds "crawled with maggots." A group whose benefits far outbalanced its small number of personnel was the American Medical Liaison Officers, attached to the Chinese divisions for professional advice, organization of evacuation of wounded and procurement of medical supplies. "Without them," Hiehle tells you, "we would have caved in. In the heart of attack at all times (Maj. James S. Robbins received a sniper wound in the face), they kept us informed of the medical needs of their units so accurately that we always knew what was wanted, where and when." S/Sgt. Rupert Arnold an Air Force G.I. in Delhi, has the dubious distinction of being married to a "four-star general," at least in the nomenclature of a St. Joseph, Mo., department store where Mrs. Peggy Collins Arnold works. The Sergeant's wife has sold over $900,000 worth of War Bonds since Pearl Harbor, leading the field in every Missouri war loan drive to date, and earning the title of "four-star general" in the army of retail clerk bond sellers at the store. Pilots of the 10th Air Force, Eastern Air Command's famed Twin Dragon fighter squadron, their marauding operations slowed down by monsoon weather, have tuned to hunting trips to keep shooting eyes sharp, and incidentally, keep the mess table stocked with fresh fowl. Piling into jeeps and hiring a variety of bearers, beaters and trackers, the boys plunge deep (well, 10 miles) into the jungle on safari, and after hours of pursuit and considerable consumption of ammunition, return with numerous "khana" birds to grace the frying pan. "Khana" birds are defined as any edible fowl. Foraging for their chow like many another Army in times past, the boys also keep in shape for an early resumption of shooting at their favorite game - the Jap. Army Airways Communications Service personnel at an India ATC base set some kind of record this week when they pulled in a lost airplane with their radio navigational aid equipment less than 10 minutes after the set had been installed. After nine days work, the AACS crew made a final correction, rendering the equipment operational just as a violent thunderstorm broke over the area late in the afternoon. The boys jumped in a jeep and beat it to the control tower to pick up their orders, preparatory to departure. They arrived just in time to hear a radio operator inform a lost transport pilot the station was not prepared to "shoot a bearing" on him. "Oh yes we are buddy," corrected the AACS lads, who promptly jumped back in the jeep, tore out to the new site and took a "fix" on the distressed plane. Soon afterwards, the transport and its grateful pilot popped out of the storm clouds and landed safely at the field. Cpl. 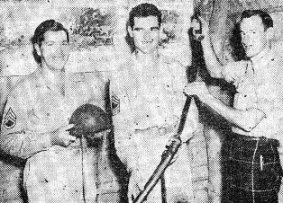 Charles Stuart, right, a member of a Scottish unit that was fighting around Imphal, presents a Japanese Samurai sword to M/Sgt. Clarence H. Connerly, center, and S/Sgt. Edward C. Komm of the 10th AF in token of appreciation for support rendered by the Skull and Wing Medium Bomb Squadron. BOMBER BASE, INDIA - The Skull and Wings Medium Bomb Squadron of the 10th Air Force are the recipients of a Japanese Samurai sword and helmet taken from an enemy officer killed at Imphal after presentation of the mementos by British troops in a gesture of thanks to the Yank airmen for the support which helped the 14th Army to clear the invaders out of India. 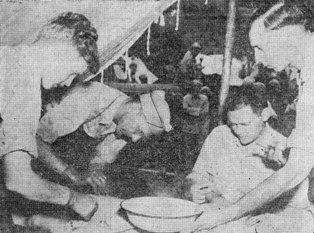 The British troops expressed further appreciation for American cigarettes donated by the Skull and Wings Enlisted Men's Club and flown into Imphal during a period when the squadron was delivering ammunition by air. The Enlisted Men's Club has a letter from Lt. Gen. G. Scoones, British corps commander, who wrote, "I am writing to thank the enlisted men of Skull and Wing squadron for their most generous gift to the enlisted men of my corps and to say how very much we all appreciate the spirit in which this gift was made. "The spirit of comradeship means a tremendous lot to us. May I take this opportunity of expressing to you our admiration and thanks for the grand assistance we get from the American Air Corps." The Skull and Wings G.I. 's contributed $300 worth of cigarettes from their club funds and officers made a similar donation for the hard-pressed British in Imphal. After a week-long advance down the Myitkyina-Mandalay railroad, troops of the British 36th Division of Maj. Gen. Festing captured Pinbaw, 26 miles southwest of Mogaung, and sent patrols down the heavily-bombed rail line as far as the village of Kondangyi. In the area south of Myitkyina on the North Burma front, Chinese troops of Gen. Joseph Stilwell were relatively inactive, continuing patrol activity around Kazu. Stilwell's prediction that "we will be back" at the time of his famous 1942 "I claim we got a hell of a beating" statement was recalled this week with the announcement that over 10,000 square miles of Burma have been re-captured, with well over 20,000 Japanese killed in the process. On the Imphal front, British 14th Army units, held up more by weather than the negligible Jap resistance, captured Pyinbon Sakan, four miles from the Chindwin River. The British have now liberated 70 miles of the Tiddim Road in the six weeks since the last real Japanese stand at Ningthoukhong-Kha Khunou on the Imphal Plain. To accomplish these gains, 14th Army troops were using "hook" tactics, bypassing roadblocks by means of lengthy jungle marches over high hills and through driving rain to outflank the enemy. British long-range forces, operating far in advance of the main body, continued to harass Jap communications. Raids by them were reported at points over 100 miles apart, at Tongzang and Falam, with 117 Japs killed and 16 trucks destroyed in three skirmishes. Meanwhile, Lord Louis Mountbatten, Supreme Commander for Southeast Asia, returned from London conferences where he told correspondents the Japs had more than doubled their forces in Burma in an effort to hold the country. Allied casualties this year in Burma totaled 10,000 with 3,000 more missing, as against 42,000 Jap dead, Lord Louis said. 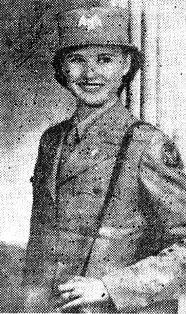 MEET EDIE Lt. Edith M. Dillard of the WAC. She's been adopted by the "Eagle Squadron" somewhere in China. The Eagle Squadron is all out for WACs in China. MYITKYINA - Sgt. John A. Grant, Signal Corps photographer, claims he pinched himself . . and he wasn't dreaming. The sergeant was covering the North Burma campaign with his camera. He had photographed dead Japs, bunkers, equipment and warehouses. At the last warehouse he had picked up a Jap sun helmet, jammed it on his head and rushed to the airfield to catch a plane. He wanted to get his film to the laboratory. Dashing up to the plane, he was confronted by a brace of shavetails who snapped to attention and whipped off brisk salutes. After all, he reasoned, there's no accounting for the actions of lieutenants. But when a few paces farther, a grizzled major gave him the high ball, he began to wonder. And when, at the plane, a British brigadier general grabbed his camera case and said, "Here, let me help you on the plane, old chap," he knew something was wrong. After the take-off, Sgt. Grant removed the Jap helmet to scratch his puzzled head. And there, on the front of the headgear, glistened a single silver star. HQS., TENTH AIR FORCE - Along a road turned to a sea of mud by monsoon rains, S/Sgt. Edwin H. Phillips walked towards the fighter strip used by planes of his outfit, a P-51 squadron of the 10th Air Force, Eastern Air Command, known as the "Burma Banshees." Suddenly Phillips sank in mud to his waist, and as he struggled to get free he sank deeper in the morass. Fellow squadron members, attracted by his shouts, tried unsuccessfully to pull him out; then brought a jeep which itself became mired down. At last an Army truck appeared on the scene, and Sgt. Phillips, clinging to the tail gate, pulled himself free, but minus his brand new pair of G.I. shoes. 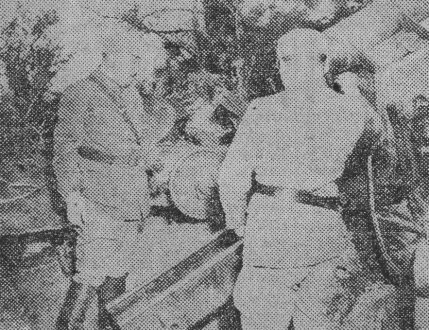 Gen. Wei Li-Huang, Commander-in-Chief of the Salween forces, inspects a 150mm gun of German manufacture. Backed by bombers and fighters of the 10th Air Force and a pulverizing concentration of artillery and mortar fire, Chinese troops of the 20th Army Group drove forward in fierce street-to-street fighting within the walls of battered Tengchung this week on the Salween River front. The 60 sorties flown over the city by 10th Air Force planes under the personal direction of Brig. Gen. Russell Randall represented their first appearance in this sector, previous air support having come from the 14th Air Force, whose skip-bombing tactics breached the city's walls for the original assault. Chinese advances were recorded in the southwest part of the city as stubborn Jap defenders were pushed back to within 200 meters of the center of town. Large quantities of supplies, including medicines and tinned food, were captured, and many enemy dead counted. American doctors examining these, found many with burst eardrums from the terrific bombardment, which has reduced the city's buildings to such a mass of rubble and dust that incendiary bombs are no longer effective. The Y-Force operations staff, commanded by Brig. Gen. Frank Dorn, which is co-operating with the Chinese armies, reported seven pillboxes had been taken in the vicinity of a Confucian temple where the Japs are firmly entrenched. Other forces stormed and took the British consulate compound. The Chinese now hold all the city outside the walls, an area of typical village construction, plus the southwest third of that part within the fortifications. In other areas, Chinese fighters detonated 6,000 pounds of TNT against Jap positions at Sungshan, where resistance is blocking use of the Burma Road. Over half of 62 Nips killed in the explosion were found to be wearing bandages, indicating wounds. At Lungling, heavy fighting was in progress with severe casualties on both sides. One indication of Jap determination was shown by the fall of hitherto impregnable positions in the Kaoli Kung mountains. Chinese attacked and overpowered the garrison, cut off since the fall of Chiangtao, June 21, to find them too weak from hunger to resist. Many had died of starvation. The Chinese forces, meanwhile, were receiving tons of food and supplies by air. 14th AIR FORCE BASE, CHINA - Slated for a series of one-night stands at G.I. 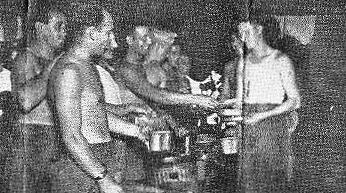 hostels in China is "Gin Bow Jive," variety show dreamed up by men of the "Red Gorilla" fighter squadron. A mixture of racy skits and serious octet chorus numbers, and featuring the usual muscular chorus with "waterwings" and titian rag-locks, the one-hour show was produced by medical officer Capt. James Gaume with S/Sgt. Albert Villani as idea man. Members of the cast are Lts. Irwin Weisbarth, Edward Ortega, Leon Gonzalez and George Ruddy, S/Sgts. Lawrence Goldsmith, Paul Gibaud and Edward Major, Sgt. Irving Cowling and Cpl. John Vinty. The "beef trust" chorus includes S/Sgts. Ronald Abbey, Robert Bruch and Rudolph Fehr, and Sgt. Neal Brown. The anopheles mosquito is a most peculiar chap. For his size he's more annoying than a five or six year brat. And he's just as full of cunning as an egg is full of meat. By the jumpin' Jeeps of Henry, he'll collect himself a bite! He has strictly stuck to business and let others take the blame. So he goes about in silence and he finds it much more fun. Whose malarial existence from his life is taking toll. But the meal is quite upsetting and he doesn't keep it down. In the very spot he bit you does he really "got to town!" And the first thing you're aware of is that you are sick as Hell. Which will hide you from Anopheles from dusk to dawn each day. CHINA - Add to the ever-growing list of G.I. journals in the Theater, the Daily Fishwrapper, published by men of the "Bombing Eagle" squadron of the 14th Air Force. S/Sgt. Robert A. Aylward is editor, with cartoons by Sgt. Charles F. Wright a special feature. Policy of the paper is to "preach goodwill among the Allies, champion the Chinese soldier, and show that CBI-men are generally better off than some of them realize." To clinch this last point, the publishing staff to a man has voluntarily signed up for more time overseas..
EAC HQS. - Aircraft of the Tenth Air Force, Eastern Air Command, appeared for the first time this week on the Salween River Front, lashing at Jap-held positions in Tengchung and Lungling in support of advancing Chinese ground forces. The Chinese armies in this area are now aided by air power of both the 10th and 14th Air Forces. EAC P-51's destroyed two Jap fighters in a sweep over Chefang while P-47's of the India-based forces covered the Burma Road from Tingka to Bhamo. The northern section of the Mandalay-Myitkyina rail line was again heavily hit by fighters and B-25's, the town to Pinbaw being virtually demolished by bombing. Damage was inflicted also at Hopin, Myothit and Katha. Mitchells, striking at the important Mu River bridge, left two spans down in the water, and also destroyed an ammunition dump south of the target. RAF planes maintained their close support of 14th Army troops on the Tiddim Road, also pounding Jap troop concentrations and strong points along the Chindwin River from Kalewa north 90 miles to Thaungdut. Long-range fighter-bombers, operating in Central Burma, shot up a large number of railroad cars and trucks and destroyed or damaged more than 100 river boats. War, as a certain genial old CBI character once remarked, is not only difficult but sometimes even dangerous. In recognition of these dangers on the home front, members of the Army of the Potomac in Washington have issued a pamphlet, Pvt. Droop Has Missed the War, warning G.I. 's of the risks facing them when they venture forth after duty hours into civilian surroundings - fast driving, jay-walking, driving while overtired or after drinking, swimming in unfamiliar places, etc. Bolstered by these advices, says the War Department, the troops have been returning to duty with a minimum of cuts and bruises. This item of news, friends, points up a longfelt need in this East of Suez area. The weary aircrewman who forsakes enemy flak and fighters for some jolly rest and recreation in the big city wots not of the new and insidious perils he faces. Your faithful drudge of the paper troops, as he nightly unswivels himself, empties the various pigeon holes and toddles out to town, little reckons that danger awaits on every corner. Plainly a warning pamphlet for CBI is in order to keep these lads from harm; the title: Don't Keep Your Head Up. First prominence should be given to the CBI system of left-hand traffic. Many a pedestrian G.I., no mean taxi dodger in his day, has glanced automatically to the left, then stepped blithely off the curb, only to hear squealing brakes on his right and a torrent of angry Hindustani as another Sikh hack-driver registers a near miss. Our pamphlet must recondition the jay-walker's reflexes. Riding in one of these taxis, a rattle-trap peanut roaster with negligible brakes and a consumption wheeze in the engine like Camille in the last act, is frequently an Air Medal mission in itself. As the flivver bowls along the streets, weaving a heart-stopping pattern around trucks, street-cars and other onrushing taxis, the driver is probably looking back at your bloodless countenance with a toothy smile and suggesting places you really ought to visit. Not infrequently he bounces off a gharry or rickshaw, with resulting carnage horrible to behold. The daring adventurer who chooses a bicycle is another G.I. who should be apprised of certain facts else he is a sure casualty. No ex-American cyclist, born to the reversed-sprocket style brake, ever fathoms the English hand-brake. The sight of a Yankee soldier careening across a busy intersection on an unchecked bicycle, pedals vainly whipping the air backwards in what was intended as stopping procedure, can take years off one's life. In China, where sweating coolies carry buckets of sewage through the streets one must beware of engaging a rickshaw boy who hustles peli-meli through the stream of traffic. Regardless of other possible violent contacts, those sewage-carriers are no men to be jostled. The tonga, a distinct type of one-horse carriage with fore-and-aft seating facilities, flourishes in peaceful India, but with risks of its own. 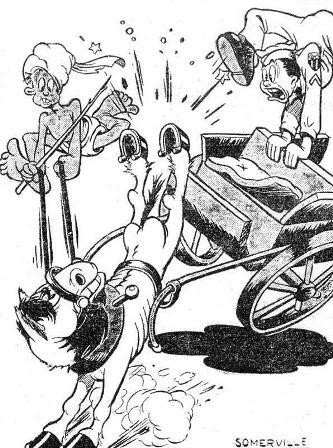 All tonga-wallahs are on the worst possible terms with their horses, and a trip behind one of the bony, surly nags is a succession of cursing, lashing and balking as the two of them fight it out. The horse's trump card consists of trying to whack loose the footboard on the front of the tonga with a series of terrific kicks from his hind legs, to the delight of the G.I. passenger. Dobbin has one other nasty trick, which could be avoided if the tonga were not harnessed so close to the horse. There are other troubles. Our pamphlet must include a chapter on rest camp, the activities of Indian bus drivers on mountain roads, and the horrors of horsemanship for ground-bound novices. Assam lads who are not yet blind or embalmed should be warned of the properties of Bull Fight brandy. City-based cavaliers must be told about meeting such nice people in the black-out, and cautioned against the disillusionment that may follow. Our trusting trooper of CBI, setting forth innocently on leave should be apprised of the harms to which he is a prey. Our cozy booklet, a guiding hand, a friend in need, would bring him back safely, and able to report happily, "I never had it so good."